Is immigration policy killing the American Dream? It's a story repeated throughout American culture, in theatre, film and novels: the penniless immigrant arrives on American shores seeking a new life and, through hard work and determination, prospers and thrives. Such tales are a quintessential part of the "American Dream", the idea that anyone willing to work hard and think big can come to the US and "make it". But, at a time when immigration is a divisive, hot-button political issue, is that dream still possible? The dream itself is alive and well, says Ben Johnson, the executive director of the American Immigration Council. "The spirit of the people who have the drive to uproot themselves and pursue this dream across the world is powerful. It continues to shine through," Mr Johnson told the BBC. But the spirit is not sufficient if the system won't allow it. And America's immigration system does not make it particularly easy to start a new life on its shores. American immigration policy is largely family based, meaning residency is most commonly granted to the immediate family of existing residents or citizens. For others, visas are granted mostly based on skill levels, with highly skilled immigrants having a much easier time getting work permits than unskilled labourers. So-called skilled workers - usually people with a university education or professional training - have a range of visa options. The most common visa, the H1B class, currently has a ceiling of 65,000 each year. That quota is easily filled every year. Before the recession, it was filled in the same month the visas were released. At the moment, Mr Johnson says, it gets filled in eight or nine months, meaning that for several months of the year, H1B visas simply are not available regardless of the demand for them. For unskilled labourers, the US grants just 5,000 work visas each year to people employed in fields other than agriculture. Yet, according to Maurice Belanger, a director at the National Immigration Forum, the US economy was absorbing about 300,000 such workers each year prior to the recession. These workers are illegal or undocumented. Although there are certainly examples of undocumented immigrants becoming prosperous, mostly they are concentrated in low-paying jobs and have essentially no power to bargain for improved conditions. The threat of deportation hangs over their American dreams. Those penniless immigrants are not thriving like their celebrated predecessors. 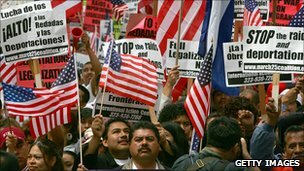 Clarissa Martinez, an immigration expert at the National Council of La Raza, a Hispanic civil rights group, says that America's immigration system is hindering the ability of foreign-born people to achieve the American Dream. 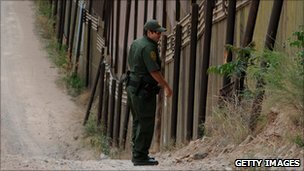 "We're going through a period where we are seeing if immigrants can make it blindfolded and with both hands tied behind their back," Ms Martinez told the BBC. "We are experiencing a systemic failure. We have a system where legal immigration channels are clogged and that is fostering the growing undocumented population." Mr Johnson says that the failure of Congress to reform the immigration system in recent years is America's loss. The US, he says, is missing out by refusing to seize on the desire of foreigners to become part of the American labour force. He argues that America would be better off if it treated immigration policy as a recruitment tool rather than "a terrorism net that people have to try to swim through". In recent years in particular, American politicians have tended to view immigration through the lens of terrorism or national sovereignty rather than as an opportunity to add dynamism and flexibility to the labour market, Mr Johnson says. "There is a kind of arrogance in our immigration system that we believe that whatever hurdles we throw down, people will be desperate enough to come to the United States that they will find a way to put up with them," Mr Johnson told the BBC. Mark Krikorian, the executive director of the Center for Immigration Studies, firmly disagrees that America is missing out by not opening its doors to immigrants. "Whose American Dream are we talking about?" he asks. "Immigration policy is a boon for the immigrants coming here. But what about the American dreams of Americans?" Mr Krikorian argues that low-skilled foreign workers are flooding the American market, competing with American workers. Even with low paying jobs, those workers and their families are often better off than in their home countries. But their willingness to work for pay and conditions that many Americans refuse to tolerate has had a depressive effect on wages at the low-skilled end of the labour scale, Mr Krikorian says. That disproportionately affects the economic mobility of African Americans and US-born Hispanics, who make up a large part of the low-skilled work force. "Anybody who needs a leg up in the labour market - young workers who don't have college, handicapped people, ex-cons, recovering drug addicts - sees his prospects sabotaged by [illegal workers]," Mr Krikorian says. Denying employers access to cheap illegal labour could force them to provide better wages and conditions to lure legal workers. Moreover, he argues, these cheap workers are holding America's economy back by reducing the motivation to invest in technologies that save money over the long term. For example, there is little incentive to develop advanced harvesting techniques when there is a ready supply of people to do the work without the capital investment. "Productivity increases are where long-term wage improvements have to come from. We are retarding that process by reducing the incentives for employers to invest," he says. "Low-skilled immigration isn't good for American competitiveness in the long run." In the end, Mr Krikorian says, the choice comes down to whose American Dream do you support: the dreams of Americans or of foreign born immigrants? "I choose Americans," he says.